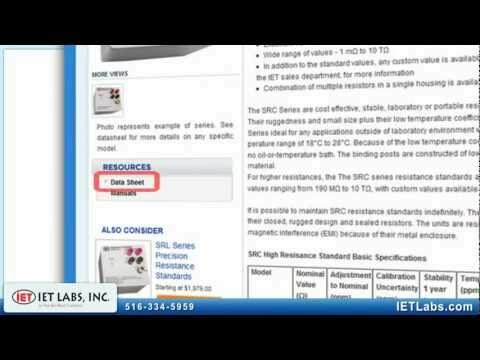 At under $600 for most values, the IET SRX and SRC series are cost effective yet high performing, stable laboratory or portable resistance standards. The SRX and SRC series are available in 35 resistance values ranging from 1 Milli-Ohm to 1 point 9 Tera-Ohms. Custom values are available to satisfy any requirement. Each SRX and SRC standard comes with an I S O 17-0-2-5 calibration certificate, indicating uncertainties and the actual readings of the resistor. Ruggedness and small size make the S R X and S R C Series ideal for any application outside a laboratory environment. Because of the low temperature coefficient, they require no oil bath. It is possible to maintain these resistance standards indefinitely. Calibration cost is so reasonable that many labs have found it more cost effective to acquire S R X and S R C resistors and put them on very long calibration cycles rather than purchase low cost loose resistors that require frequent calibrations. These standards will work at very high currents and voltages. Additionally, they can be custom ordered with current ratings of more than 20 amps and voltage ratings more than 10 Kill-ah-watts. 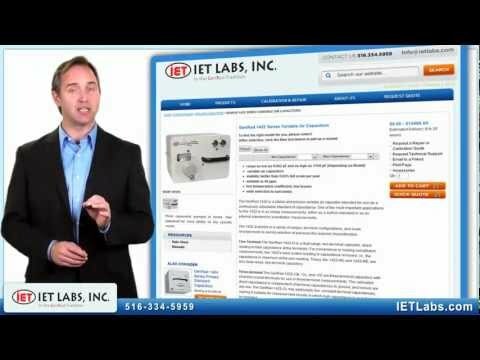 This is just another example of IET's commitment--unique in the industry--of providing the customers exactly what they need to satisfy their requirement, even in an economical product. With a simple phone call or email, we can expedite the selection process and help you find the best model for your application and budget. 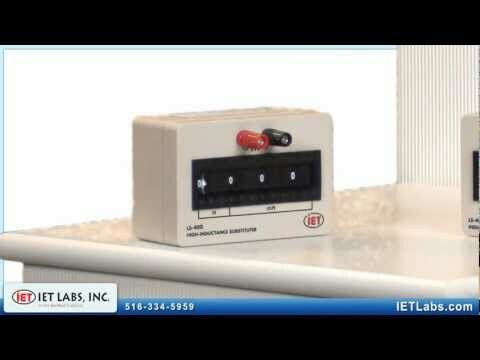 The IET Labs L S Series, Inductance Substitution Boxes, is made up of three cost effective models, starting at about six hundred dollars. These decade boxes are indispensable tools for applications in engineering, design, troubleshooting, or service. They are perfect for the lab and small enough and rugged enough for use in harsh field environments. (During this paragraph show all 3 models LS-400, LS-400A, LS-400L). The LS Series Inductance Substitution Boxes employ toroidal inductors on deep gold plated thumbwheel switches. Any inductance is simply set and read as one number. For example to set 4 point 2 3 4 Henries (On LS-400 Dial starting with setting on all 0's. From the left side dial 4 2 3 4) That's all it takes. The three standard models cover a wide range of inductance values from as low as one Micro-Henry up to ten Henries. They all have accuracies of two percent. -The LS-400 A goes form one Milli-Henry to up to one Henry. -The LS-400 goes form one Milli-Henry up to ten Henries. -The LS-400 L goes from as low as one Micro-Henry to one Henry. The L S Series substituters are manufactured in the United States and are the most practical and economical inductance substituters you can own; packing a lot of performance into a small package. Similar versions of this series in resistance, the R S Series, and capacitance, the C S series are also available. If your application is more demanding, IET offers the GenRad 14 91 Precision Decade Inductor; the most accurate and stable decade inductor available. For computer controlled programmable models look at the P L S series. To determine which model best for you, please consult our data sheet. IET manufactures the most extensive line of decade capacitors available in the world. 10 distinct series cover an extraordinary range, from the ultra low point zero zero 2 Pico- Farads to the ultra high 1 Farad. We have a model that will fill any conceivable requirement or budget. Here is a thumbnail summary of what is available. The CS series is the most cost effective and the most popular. Available from 1 Pico-Farad to 1000 Micro-Farads, with accuracies ranging from 1 percent to 4 percent, these rugged units are controlled by easy to use thumbwheel switches. For highest performance, calibration grade decade capacitors consider the HACS Z series (Say HACS as one word). With a high accuracy of point zero 5 percent, these units provide any range of capacitance from 1 Pico-Farad to Ten Thousand Micro-Farads. The zero capacitance is less than point 1 Pico-Farad and the temperature coefficient is better than 20 P P M per degree C.
The GenRad 14 13 is the world's defacto precision decade capacitor, with similar performance to the HACS Z series but with a range of 1 Pico-Farad to 1 Micro-Farad. The 14 13 has been the choice of the metrology community for decades. The GenRad 14 12, with an accuracy of zero point 5 percent, is another high performance capacitance decade but at a more economical price. It goes up to 1 Micro-Farad while achieving high resolution by use of a variable air capacitor with 1 Pico-Farad dial divisions. For even a more economical option with a long proven history, consider the Gen Rad 14 19. Ranges are available from 100 Pico-Farads to 1 Micro-Farad with accuracies ranging from zero point 5 percent to 1 percent. The unique GenRad 14 17 is the only choice when extremely high capacitances are required. It has 7 switchable values that go from 1 Micro-Farad up to the envelope pushing 1 Farad. The Gen Rad 14 22 series variable air capacitors are the world standard when it comes to very low capacitance. There are several models available that offer continuously dialable ranges from point zero zero 2 Pico-Farads to 1000 Pico Farads with incomparable stability and performance. Finally for R-S-232 or I triple E computer controlled, programmable models that are suited for automated test stations, you should be looking at our P C S Series. Of course this is just a quick overview. To find exactly the best model out of the hundreds that are available, without having to settle, please consult our website or contact the IET sales department. and help you find the best product for you application and budget. 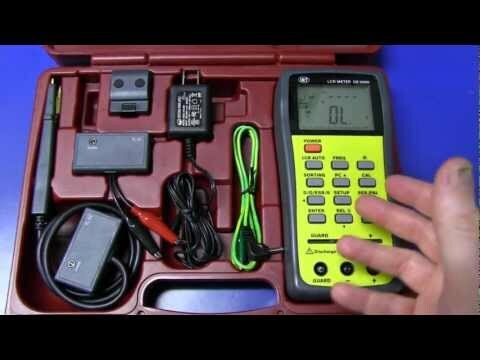 What's inside IET Labs new DE-5000 handheld LCR meter? MDO-2000E series is equipped with a dual channel 25 MHz arbitrary waveform generator. We could utilize arbitrary waveform generator to output waveforms and conduct frequency domain analysis by the built-in spectrum analyzer.